I don't think I can wait till I get real French butter before I start making butter cookies. 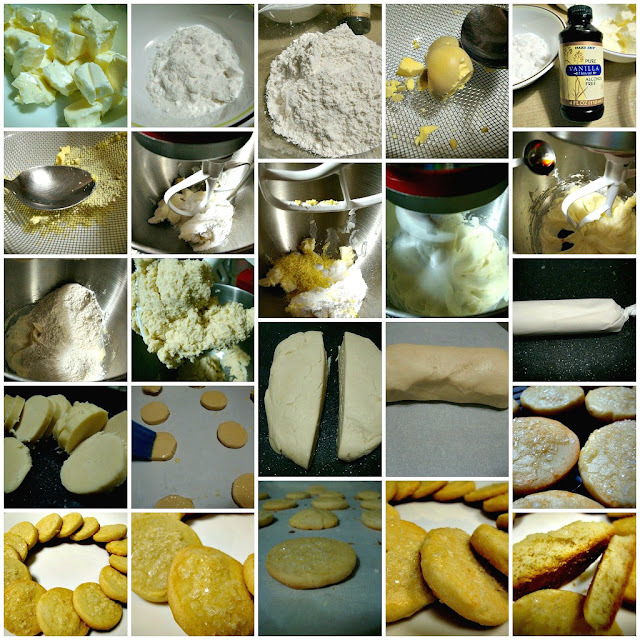 Having tasted real French butter cookies rekindled my affection to the cookie and developed it to something deeper. Now I'm craving it too. While French butter is great, we have Grade AA butter here in America that I can use for now just to start my butter cookie escapade. I found an interesting recipe with a video which is worth trying. The recipe eliminated a couple of sources of moisture which affects the consistency of the cookies. Sables or butter cookies should have that crumbly texture so the liquid components should be very minimal. The butter content was reduced to a stick and a quarter and the egg is hard boiled and only the yolk is used. The results are: taste wise- very subtle butter flavor and I think it's because I didn't use French butter; the texture is very close if not the same as La Mere's and the sweetness is to my liking. K actually said it's really all about the butter- meaning texture can be achieved but taste lacks the Frenchie punch. Ronnie didn't complain- he loves butter period! Next in line is another recipe I stumbled into which uses more butter. I was intrigued because this one uses powdered sugar in addition to the granulated sugar claiming it is for texture. I still don't have French butter because I don't have time to go shopping for it. I just thought this recipe seems worth a try. Cut the vanilla beans in half lengthwise and scrape the seed pulp into a small bowl; add the granulated sugar. Using your fingers, rub them together until blended. In a stand mixer fitted with the paddle attachment or in a large bowl with a hand mixer, mix the butter on low speed until smooth and creamy (you don’t want it to get light and fluffy), about 1 minute; mix in the salt. Add the vanilla sugar and the confectioners’ sugar and mix until smooth, about 1 minute. Scrape down the bowl as needed. Add 1 egg yolk and mix for 1 minute. Still on low speed, mix in the flour just until blended; the dough will be soft. Position oven racks in the top and bottom thirds of the oven and heat the oven to 350°F. Line two baking sheets with parchment or silicone baking liners. Sprinkle about 1/2 cup sanding sugar onto a piece of waxed paper. Combine the remaining egg yolk with a splash of water in a small bowl and whisk with a fork. Brush each log with the egg wash and roll it in the sanding sugar until evenly coated. Trim the ends of the logs if they’re ragged. Using a knife, cut the dough into 1/2-inch-thick rounds. Put them on the baking sheets, leaving about 2-inches between rounds. Bake the cookies, rotating and swapping the baking sheets’ positions halfway through, until the cookies are brown around the edges and golden on the bottom, 18 to 22 minutes. My cookies are done in 16 minutes so you can set your timer to 18 but keep an eye on it. When they start to become light brown on the sides, they should be ready. Let cool on the sheets for 5 minutes; then carefully transfer to a cooling rack and let cool completely before serving. Sablés shouldn’t be eaten warm; they need to cool so that their texture will set properly. This is a very good recipe- I didn't change anything except for the salt and the vanilla bean. The texture is very Sablés and they were delicious even with the use of Grade AA American butter. I think I'm getting closer to my goal! Thank you! The one with vanilla bean is really good. The use of whole egg and more butter made it so IMO. And the powdered sugar really gave that wonderful texture. All I need now is European butter and I should be almost home! The making of "Lane Cake"
Upon Request: To Kill A Mockingbird "Lane Cake"